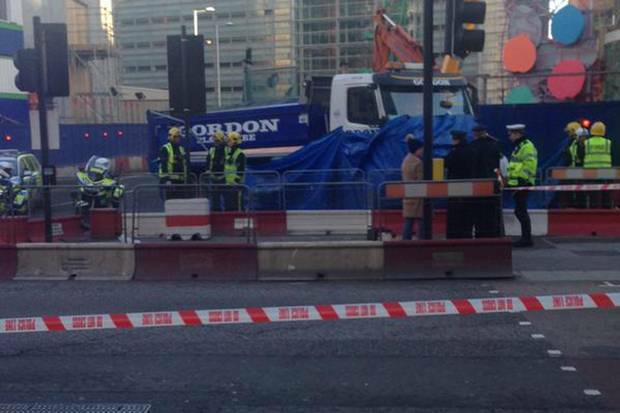 So yet another cyclist has died today. It’s not equal. Talk of sharing the road and respecting each other is simply a red herring when a mistake (whether negligent or careless or anything else) results in one party being crushed. This bit of Victoria is horrible. The ongoing works mean that traffic is siphoned through narrow diversions with poor sight lines. Frankly, I wouldn’t ride it because the lack of escape route scares the bejesus out of me. And then you add tipper trucks. 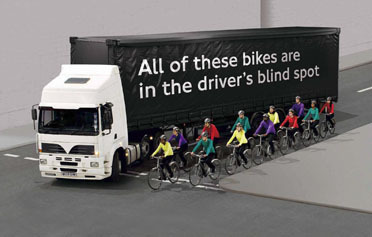 HGVs have acknowledged blind spots that almost exactly match the position of a cycle path. Vehicles that kill and kill again. So what’s the answer? Nobody rides a bike? It’s clear that sharing the road isn’t a great solution, whatever the Vehicular Cycling front would have one believe. Put simply, the risk is too high. Forget probability of being killed; humans are notoriously bad at measuring probability. Impact is the point to focus on, and that’s too high. Vehicles with blind spots are required to have a spotter when driving in cities and towns. These vehicles are so dangerous that a group of banksmen is required to guide them onto building sites and they drive at 11mph max. So why does health and safety finish the moment they leave a site? Any places where TfL is consulting for cycle paths gets temporary lane dividers until the issue is resolved. For example, we know there’s a need for segregation on Embankment and it’s likely coming. So why not cone off that area for cyclists now? At least put something in place, rather than just waiting for the spades to go into the ground. Something needs to be done. This isn’t knee-jerk, it’s a reaction to an unacceptably grim statistic of unnecessary death. Local Authorities now hold some responsibility for local health. Everyday cycling has proven health benefits. By investing in high quality facilities that encourage everyday cycling, local authorities can reap an on-going health dividend. It’s nothing new to point out that exercising regularly is beneficial. Frequent moderate exercise has long been shown to keep both body and mind healthy; however, our typically sedentary desk jobs and car-centric travel makes it hard to incorporate exercise into our lives unless we can squeeze in a trip to the gym. Despite numerous studies, levels of exercise in the UK remain “shockingly low”, with all the adverse human and economic side-effects this brings. “So what”, one might think. On one hand, this could be put down to personal choice. On the other, the entire country has to pay for the impact of not exercising, with a health budget impact of £3bn from obesity alone. But obesity is only the headline. Families have to manage with depressed, immobile family members whose mental faculties deteriorate before their time. So how does this involve Kingston? Local authorities now have a role in public health for their citizens. Given that budgets are so squeezed that Kingston council is planning to pick up recycling only every other week, one would hope that if prevention was cheaper than cure, that this would be pursued wholeheartedly. We must therefore ask that if there is a way to dramatically improve public health through integrating low-impact exercise into the daily routine, how stupid would we be to not grab that with both hands? Everyday cycling has proven health benefits. The term “everyday cycling” is used because this isn’t referring to kitting up in lycra and cycling for 100 miles. Britain is so sedentary that replacing the drive to school or the shops with a ride in jeans and a coat will have dramatic benefits. 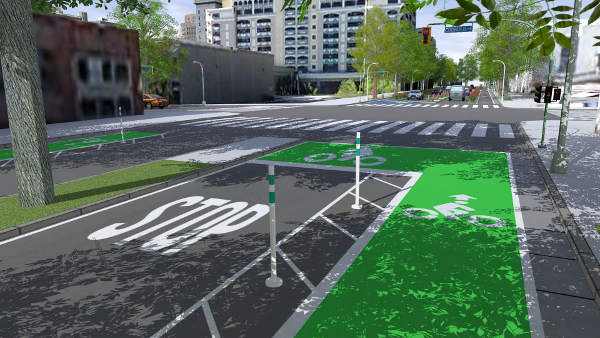 The two are linked: overcoming the first point and making it safe and convenient to cycle reduces the level of inconvenience that people are prepared to accept when driving. Thus people will ride more and drive less, causing a positive impact on their health. This has been observed in the Netherlands, where bike use is routine for short journeys for which UK residents take a car. What about the young? We’ve seen children’s diets being scrutinised in recent years – and rightly so. But twenty minutes of exercise a day would have a massive benefit on ADHD among children. Why hope that an organised gym session is arranged for children? Build exercise into their daily lives by making it safe for them too bike to school. And employers who complain about staff off sick? You can halve your number of sick days by cycling for 30 minutes, five times a week. My sister-in-law is a GP. I asked her view on the benefits of cycling. Cycling is of the best cardio-vascular activities that you can do. Unlike running, it isn’t weight bearing so it’s easy to get started. Beginners can also ride for longer than they can run. The benefits extend beyond cardiovascular, it’s great for people with complaints like SAD. It’s just brilliant! Most people have a bike and you don’t need any special great so you can get started with it. Fairly positive then with few, if any, downsides. Kingston Council is in a position of incredible opportunity. They’ve been given funding to provide cycling facilities suitable for the young and the elderly, that will invite the take-up of everyday cycling by these groups. If done right, this means that TfL will pay to benefit the health of Kingston’s citizens. However, for the council to see this positive difference in health and well-being, they need to make all the mini-Holland schemes appealing to children and older citizens. The current proposals will not reach this goal, in that they continue to use infrastructure that has failed over a period of decades. The health dividend that is reaped depends entirely on the quality of investment. If Kingston or any local authority wishes to have an ongoing health dividend, they must invest in blue chip infrastructure that will attract people to riding and out of their cars. The consultation for the first stage of mini-Holland is still open – click here to tell them to fully segregate it so we can reap the health dividend. There’s an example response here.